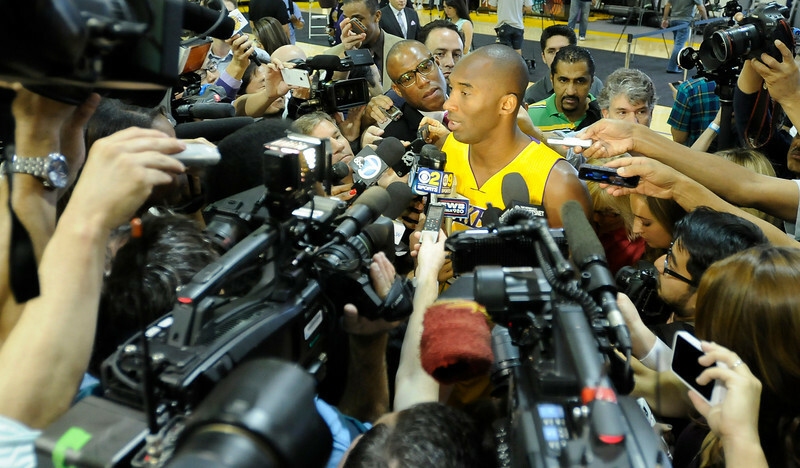 Very little could sour Kobe Bryant’s mood. He took an overnight flight from Abu Dhabi to Los Angeles a mere three hours before the Lakers’ media day began Saturday at the team’s facility in El Segundo. No problem – Bryant slept for 10 hours on the plane. Bryant sounded unsure when he will return from healing his left Achilles’ tendon. No worries – Bryant says will remain patient. The Lakers’ championship prospects this season seem deem. Not an issue – Bryant still maintains optimism. But there was one subject that soured Bryant’s mood in an otherwise joyful day. The Lakers envisioned him as their franchise leaders after acquiring him last season in a four-team, 12-player trade from the Orlando Magic. Instead, Howard left for the Houston Rockets. Looking back, Bryant sensed Howard leaving for Houston after he met with the Lakers’ brass two days into free agency. That meeting included Howard voicing frustrations about last season, according to various league sources familiar with what was discussed in the meeting. It’s not unclear to what degree he addressed them. But Howard’s frustrations last season included Bryant’s demanding leadership style, coach Mike D’Antoni preferring more pick-and-rolls than post-ups in his offense, and Howard receiving less credit than he wanted for playing through a surgically repaired back and torn labrum in his right shoulder. D’Antoni didn’t refer to Howard by name. But it was clear who he was aiming at when he made heart of last season’s team when several players, including Howard, Pau Gasol and Antawn Jamison complained about their role. Center Chris Kaman, whom the Lakers at the mini-mid level exception worth $3.2 million, even took shots at Howard on how his free agency “held up a lot of the bigs.” Still, Kaman believed Howard would drag out the process for so long that Kaman booked a vacation to Hawaii. But Howard met with five teams (Houston, Dallas, Golden State, Atlanta and the Lakers) before deciding his future in six days, and cutting Kaman’s vacation short. The Lakers have acknowledged the obvious talent dropoff stemmed with Howard’s departure both with his athleticism and defense. But they hope an added training camp, players more suited for D’Antoni’s system, a healthier roster and less drama surrounding the team will help the Lakers absorb Howard’s absence. Same thing with the Lakers. But for now, the Lakers seem to have a good riddance attitude toward Howard. This entry was posted in Dwight Howard, Kobe Bryant, Lakers by Mark Medina. Bookmark the permalink. Since the start of the off season I was against them team resigning DH as the $118 mil which only buys defense mostly but offensively he hasn’t grown to his potential, Although, I hear that he’s spent the off season in Colorado training? DH isn’t a franchise player like a KB24 or Shaq. Competitiveness should be #1 given the history as we can’t win a championship every single year. But as long as the team stays competitive = contention, the odds of winning more championships will favor the franchise. Some players only whine when they don’t get it their way, looking for more and more excuses. Dwight is a wanker and it’s good that he’s gone.